Well I think I will happen… eventually, but maybe not this time round. 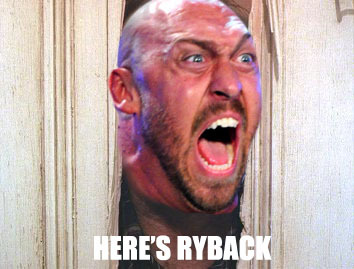 I think that Ryback does need some more push before he leaps into the main game with punk and Cena. Although yet another Punk Vs. Cena battle… I think id rather it was the Ryback at hell in a cell. I agree that Cena should have to put some work in to come back to the number one contender spot… oh wait Ryback simply had to stare punk down. But at the end of the day hell in a cell will not be happening for Punk and Ryback. I think there will be a lot of buildup followed by a lot of smack talk. Then CM Punk will come out and say that Ryback doesn’t deserve to fight him, he’s the WWE Champion and he doesn’t need to fight him, which I will applaud him if he follows through. Ryback needs to move on and build up his matches. So Punk faces Cena. How does that happen? Step 4. Mick Foley demands the match, Punk gave him a dig this would be a way of getting him back. Step 5. Punk Vs. Cena Hell in a Cell.